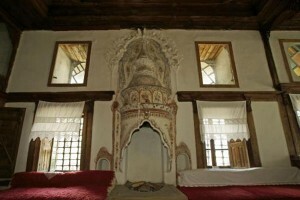 Skender Skenduli, another wealthy land owner, built the Skendulate House (22) in 1823 during Gjirokastra’s greatest period. The house had two courtyards and is unique in having both an internal and external staircase. It used to have 46 chimneys, indicating the wealth of the Skënduli family. The main guest room (oda), in particular, is distinguished by its decorated ceiling and wooden poles, just as the many other wooden decorations throughout this house give it an unrepeatable value. The great number of loopholes and the sophisticated locks of the main doors bear witness of its defensive function. It is open for visitors; there are not yet exact times of opening hours. A family member will appear always to guide you inside. Entrance fee is 200 Leke.